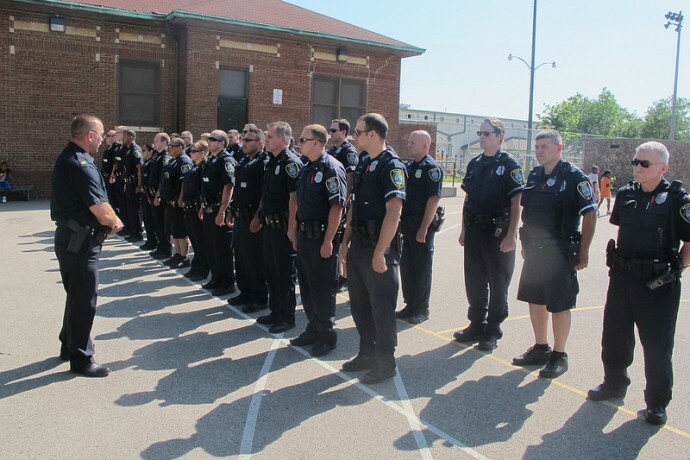 In a recent show of force and cooperation between law enforcement and neighbors, more than 50 police officers gathered for a roll call just prior to dinner at the Auer Oasis free family meal program site, 2319 W. Auer Ave. Recent concerns about loitering and drug use in the area surrounding the Auer Avenue School where the meal program is run led to the roll call, according to Sherrie Tussler, executive director of the Hunger Task Force. The agency runs the meal program. “We’ve had some safety challenges in the area,” said Tussler, as she stood in the school’s playground. Still, Tussler said the program is very well attended, but having the police there helps bring a sense of community and safety for the people who participate. “We want people to know that it is safe to come here,” said Tussler. Capt. Tom Stigler of the 5th District said police were there, first and foremost, to interact with neighborhood children. “It’s critical that we reach children at an early age because they can be greatly influenced at this age whether it be by their parents, people on the street or by us; we want them to have interactions with positive people,” Stigler said. Stigler added that that police also wanted to show their support for community programs such as the Auer Oasis that provide safe places for kids to spend time and eat healthy during the summer. The Auer Oasis program serves lunch and dinner. 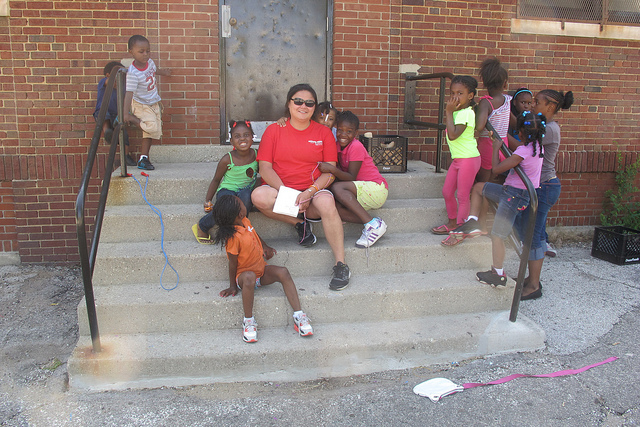 Between 60-80 kids and adults usually attend dinner, according to Jennifer West, who teaches K-4 at Auer Avenue School and is working with the Milwaukee Recreation Department there during the summer. Last week 160 people ate dinner at Auer in one day, according to West, who along with other recreation workers provided activities for kids such as kickball, tag, basketball and other games. West said that bleachers near the basketball courts had attracted people who smoked weed while children played nearby, “so they moved them.” She pointed to the bleachers, which are now in an empty section of the playground, hundreds of feet from the school. The Auer Oasis meal program was created after the Amani neighborhood was chosen as one of three neighborhoods to be funded by a $725,000 grant from the Northwestern Mutual Foundation. The money is being used to help challenged neighborhoods with limited resources meet basic needs and improve quality of life. The foundation is working in conjunction with the Department of Justice’s Building Neighborhood Capacities Program to support initiatives in Amani and Metcalfe Park. Northwestern Mutual Foundation also is earmarking grant money for Muskego Way, which encompasses parts of Clarke Square and Layton Boulevard West on the south side. The Hunger Task Force, Northwestern Mutual Foundation, Milwaukee Public Schools and Milwaukee County Parks and others are partnering to run the Auer Oasis. “We’re here providing an unmet need to the people in this neighborhood,” said John Kordsmeier, president of the Northwestern Mutual Foundation. Kordsmeier said the neighborhood is lacking in healthy food options. “They don’t get what they deserve here; they deserve much more,” said Kordsmeier.